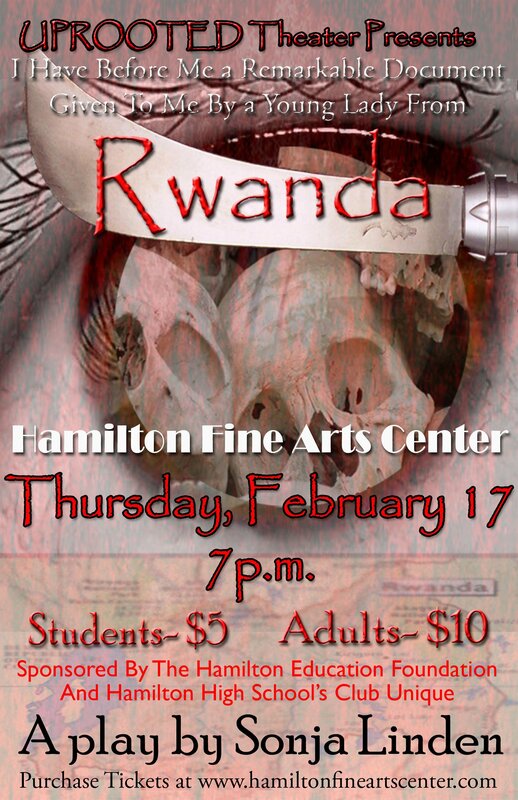 Rwanda focus of artistic collaboration at HFAC - Hamilton School District. Collaboration between the Milwaukee powerhouse UPROOTED Theatre, world-renown artist Chip Duncan and Hamilton High School’s Club Unique will make for an unforgettable evening of moving entertainment in the Hamilton Fine Arts Center (HFAC). UPROOTED Theatre will perform on Feb. 17 at 7 p.m. “I Have Before Me a Remarkable Document Given to Me By A Young Lady From Rwanda,” a play written by award-winning playwright Sonja Linden. “Rwanda” takes place in London in 1999, five years after the Rwandan genocide. This touching piece, crafted through a series of conversations, offers a glimpse of the atrocities that occurred. The play charts the bittersweet relationship between Simon, a struggling poet, and Juliette, a descendant of the Tutsi tribe who writes a book to address the terrible events of her home country’s civil war. The show incorporates the photography of celebrated writer-producer-director-photographer Chip Duncan, whose works have earned more than 100 national and international awards. Actors from UPROOTED Theatre, who nurture African American heritage and share individual voices through theatre, will participate in a “talkback” following the show to discuss audience questions. To make this remarkable theatrical performance available to Hamilton students and community members, Club Unique, a student club dedicated to acceptance and understanding of people, is collaborating with UPROOTED Theatre to provide marketing and production assistance. In addition, the show is sponsored by the Hamilton Education Foundation. General seating tickets are $10 for adults and $5 for students. They may be purchased online at www.HamiltonFineArtsCenter.com or by visiting the HFAC box office on Wednesdays from 2 p.m. – 6 p.m. The Hamilton Fine Arts Center is located at W220 N6151 Town Line Road, Sussex. No phone orders accepted, please. Countless people remember with nostalgia the tradition of Guy Lombardo with his Royal Canadians playing at New York City’s Waldorf Astoria on New Year’s Eve. Since then, the playing of “Auld Lang Syne” at the stroke of midnight has become a tradition. Enjoy the Guy Lombardo’s Royal Canadians Orchestra with conductor Al Pierson as they play the wonderful tunes of yesterday: “Seems Like Old Times,” “Boo Hoo,” “Coquette,” “Sweethearts on Parade” and “Ain’t She Sweet” as well as an occasional Lombardo style arrangement of contemporary classic pop tunes. Reserved seating tickets are $25 for adults, $20 for senior citizens and $10 for students. John Waite “Unplugged” featuring new CD, “Rough and Tumble” – April 15 at 7:30 p.m.
John Waite’s career ignited in the ‘80s with the MTV/radio staple “Change” and then exploded with the smash hit “Missing You,” which went to No. 1 on the U.S. Billboard Hot 100 singles chart. While front man for the pop-rock super group Bad English in 1989, he performed “When I See You Smile,” which sparked sold-out concert tours and a succession of Billboard Hot 100 hits. Waite is set to rock with “Rough & Tumble,” his first new studio album in four years when it’s released Feb. 22 and features the hot new single, “Shadows of Love.” This performance is supported by Milwaukee Marriott West and Proline Entertainment, LLC. Advanced reserve seating tickets are $25 for adults and $15 for students. Add $5 at the door. The HFAC is pleased to announce special guest performances by the Menomonee Falls Symphony Orchestra (MFSO) and Brookfield Academy throughout the 2010-11 performing arts season. Continuing a tradition of production excellence, Brookfield Academy is proud to strike up the band with its all-school musical, “The Music Man.” Follow fast-talking, flim-flamming Harold Hill in this all-American salute to music and romance. It is directed by Mark Salentine, Brookfield Academy Upper School Theatre Director and Sunset Playhouse Artistic Director. General seating tickets are $15 for adults, $10 for senior citizens and $5 for students. The MFSO classical concert opens with Mahler’s “First Symphony” and concludes with Karl Jenkins’ “The Armed Man,” a multi-movement, dramatic work for chorus, soloists and orchestra that explores the devastation of wars and the absolute need for peace and harmony between peoples. General seating tickets are $15 for adults, $12 for senior citizens (55+) and $6 for students.